I love dogs. I love to pet them, snuggle with them, watch them play, and, of course, train them. But I do have my limits. I also like my personal space. I like to be able to sit in my living room to visit with family and friends and decide if I want to pet my dogs or not, or if I want them on the couch with me or not, or if I just want them to lie calmly at my feet and be well-behaved dogs. 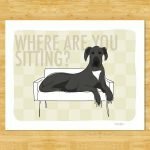 A while back, I worked with a client who was the proud owner of a very affectionate male great dane who was two years old at the time. My client had the same aspirations as me of sitting on her couch visiting with friends and relaxing, with her big boy lying calmly at her feet. But that was just not the case at her house. For over a year, every time my client sat down on her couch, her dog believed this was a call to action for a snuggle fest and was quickly up in her lap, ready for attention. Not so bad, if it’s just you and your dog. But when company comes over and you both sit down and find a huge 150 pound dog towering over you trying to clamber for a spot next to you, it can be overwhelming! So when my client had friends over, she gave up the couch and entertained in another area. She soon realized this was so silly and it was time to reclaim her space! But how was she to do this? How was her dog to learn that he needed to lie on the floor, ANYWHERE on the floor, and the couch was hers? Well, it was easier than she thought. We set up a training session where my client had a friend over, a good TV program to watch, and a couch that they were determined to reclaim as their own! The training began and they were amazed at the results. Within 7 minutes (I timed it), the dog got it! Her smart boy stopped trying to get on the couch and was lying calmly on a rug near by. No yelling was involved, no force was needed, and few words were even spoken, except words of praise. My client was so pleased with the quick results, she had wondered why she had put up with her dog’s behavior for so long! She also noted she had NEVER seen her dog be so calm and so well-behaved with company around. Who would have thought that a year-old habit could be broken in such a short amount of time? When consistency, redirection and praise are employed, wonderful things can happen. I’m proud to report that this beautiful great dane continues to understand his boundaries with the couch, and my client continues to sit in peace.